Note: This article is a different twist on our original ‘Planning for Adverse Scenarios: Savings Edition‘ article. The purpose of this edition is to address the same themes in the context of a retirement situation rather than a savings situation. Let’s face it, it’s uncomfortable to acknowledge the fact that fate dominates many of the most meaningful outcomes in life. Take marriage for example. Raise your hand if you had planned in advance to meet the person you ended up marrying on the exact day you met them. No hands? In most cases chance brought you together with your spouse, perhaps at a bar, or an ultimate Frisbee game, or chemistry class, or a work function. Maybe you met your spouse through a friend, but even then luck played a large part in your meeting. Of course, for most people the act of getting married is not something that randomly happens to you. While it may be chance that brought you together with your spouse, most people don’t just stumble into a wedding and a lifelong commitment. Fate may define our opportunity set, but it is the choices we make with these opportunities that mostly define our outcomes. Few people spend much time contemplating the role of chance in life events, but in financial markets such consideration is critical to success. With marriage, chance largely decrees who is available for consideration as a life partner, but our choices eventually play the largest role in creating a fulfilling life together. In markets, chance decrees the investment opportunities that are available to us over our lifetime, but it is our choices about how to manage those opportunities that largely drive financial success. When we first get together with mature prospective clients (over age 55), we often ask them to draw the trajectory of their wealth throughout their retirement on a piece of paper. We deal primarily with educated professionals and business owners, so many of these clients have already spent some time modelling their wealth trajectory with different levels of savings, income and returns in a spreadsheet. Most draw a chart that looks like Chart 1. In Chart 1, we have simply modelled the wealth trajectory for a 62 year old professional with a $5 million retirement nest egg who expects to withdraw about $25,000 per month in pre-tax income from a portfolio earning 7% through age 85. This is what we call “The Unicorn”, because it doesn’t exist. The trouble, as anyone who has invested in markets for more than a few months can attest, is that markets do not deliver returns in the stable, precise fashion that is presumed in the typical spreadsheet model like Chart 1. Far from it, in fact. 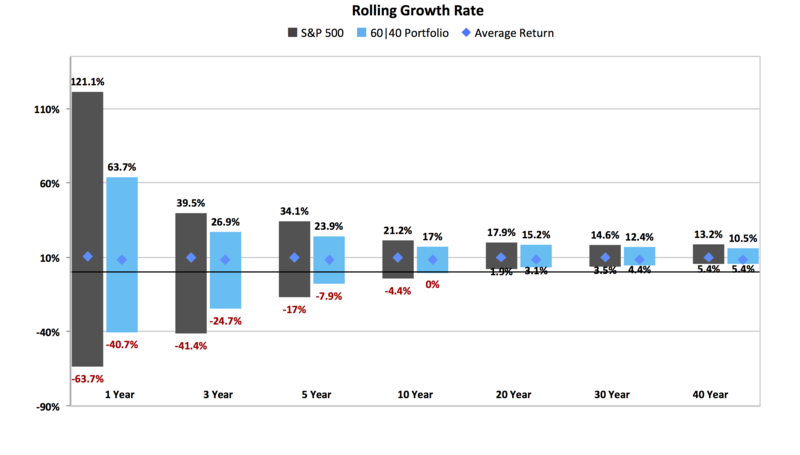 While we may determine an average expected return for a portfolio by examining the very long-term performance of that same portfolio over many decades, the often troubling reality is that most peoples’ planning horizons don’t truly qualify as long term. Typical personal planning horizons for a savings or retirement phase extend at most 25 or 30 years. Unfortunately, and perhaps surprisingly, this period is not long enough for the average return to exert much influence, statistically. Many investors fail to fully internalize the concept of average. If we find that the average height for a Canadian male is 5‘9”, does that mean that every male in Canada is 5’9”? Of course not. In fact, half are taller than 5’9” and the other half are shorter. Similarly, if we assume that average returns to stocks, for example, over the very long-term are 10%, then by definition that means returns are above 10% half the time, and below 10% the other half of the time. This concept is of critical importance because it means financial plans that are constructed to be successful based an expectations of very long-term average returns will by definition have a 50% chance of failure. This applies equally to the savings phase and the retirement phase; savers risk substantially missing their target wealth at retirement, and retirees risk running out of money long before death. Plans that are designed with an average rate of return in mind are mathematically designed to have a 50% chance of failure. Why would anyone knowingly create a financial plan where success is dependent on a coin flip? Disturbingly, this is precisely how most financial plans are constructed today. Persons in retirement face an additional layer of complexity because there is also substantial ambiguity around one’s actual age at death. As Chart 3. illustrates, the median age at death might be approximately 82 for a 65 year old healthy man, but again by definition this means that half of men die before their 81st birthday and half live past it. In fact, 5% of 65 year old men live past age 86, and 1% live past age 88. As a result, it is critical to understand – and plan for – the range around this median age in order to maximize your chances for success. The concept of a range of potential returns as decribed in Chart 2. above above may be difficult for some to understand in the abstract, so Chart 4. below helps crystalize the concept with real historical data. The chart shows rolling total returns to U.S. stocks over all 20-year (240 month) periods from 1900 to 2013. Observe that over the 20-year period from 1980 through 2000 – a horizon that most investors over the age of 45 remember vividly – equities delivered annualized total returns of almost 18% per year. At the other end of the spectrum, over the 20 year period after the 1929 stock market peak – through the Great Depression and WWII – U.S. stocks earned average total returns of just 1.9% per year. For a person drawing down $25,000 per month over 20 years, a 16% per year difference in returns represents the difference between running out of funds 9 years early and leaving a legacy of over $100 million! Of course, it is illustrative to consider the range of returns over shorter and longer periods than 20 years, as in reality peoples’ investment horizons span from under 1 year to 40 years or more. Chart 5. quantifies the range of returns to both an all equity portfolio invested in the S&P500, and a ‘Balanced’ portfolio invested 60% in the S&P 500 and 40% in U.S. 10-year Treasury bonds over the same 113 year period as Chart 4. The light blue diamonds inside each bar show the long-term average returns exhibited by each portfolio, while the size of the bar represents the range of outcomes observed over the past 113 years. The average return for stocks was about 10%, while the average return to the balanced portfolio was closer to 8% over the entire period. The numbers at the top of each bar describe the best results, and the numbers at the bottom the worst. Look closely, because the extreme range of 1-year returns obscures the surprising magnitude of the range across longer horizons. Note for example that over all rolling 20-year (240 month) periods from 1900 through present day returns ranged from almost 18% at the high end to under 2% at the low end! Chart 5 exposes a curious but extremely fundamental reality: Despite the fact that stocks have delivered an average of 2% per year in excess returns, over every single investment horizon covered in the chart – even over 40 years – the worst outcomes for a balanced portfolio were equal to, or quite substantially better than, the worst outcomes for an equity portfolio. 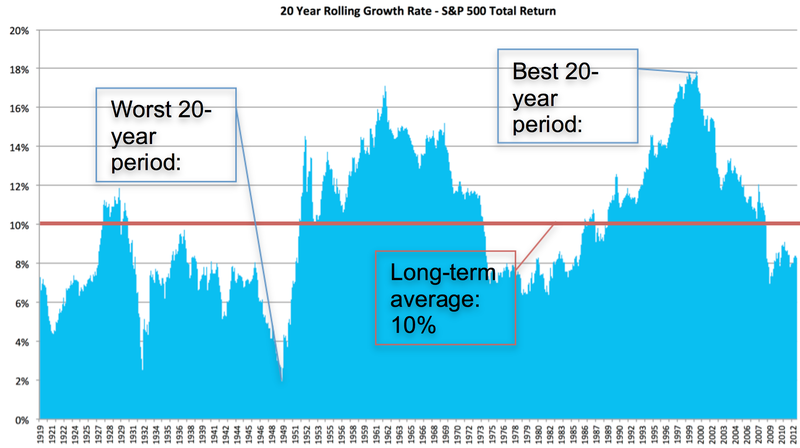 Remember that if we plan for long-term average returns, plans will fail about 50% of the time. For retirees, the same concept relates to your expected age at death. Robust plans must account for the potential for materially adverse outcomes. That’s why we prefer to create plans that will be successful even if the returns to the portfolio are worse than 90% or 95% of historical periods. Indeed, we can certainly conclude that you cannot make an optimal portfolio decision on the basis of average returns alone. You must know something about the range of returns around that average so that you can create a plan that is resilient to bad luck. So how can we determine the potential magnitude of bad luck? This question returns us to the bell curve from Chart 2. We’ve modified Chart 2. very slightly in Chart 6 below to illustrate how the range of outcomes in the bell chart can be quantified by measuring the volatility of the underlying portfolio. Very simply, all things equal a portfolio with a higher volatility will have a wider range of potential outcomes. This means that choosing a more volatile investment approach will mean your investment outcomes will resemble a lottery. The volatility of the portfolio you choose will dictate how lucky you might be and – perhaps more critically – how unlucky you might be. We know from observing history that equities have a long-term average volatility of about 20%, while a balanced portfolio has exhibited volatility of about 12%. We can observe from Chart 5 how this difference in volatility impacts the range of possible outcomes for each portfolio. The all equity portfolio has generated returns between 2% annualized and 18% annualized over a 20-year period while in contrast the less volatile balanced portfolio traced a smaller range between 3% and 15% over the same horizon. To put this in more concrete terms, imagine a retiring professional, Tom, with $5 million in savings, who plans to draw income of $25,000 per month (increasing each year at 3% for inflation) in an all-equity index portfolio with expected returns of 10% per year, consistent with the long term average. He figures if the next 20 years go exactly as planned, he should be able to draw his desired income through death and still leave a chunky legacy to heirs or charity. However, we know that the long-term average hides tremendous variability. In Tom’s case, his equity portfolio might run out of money as many as 9 years early, or he might leave an almost unimaginably large legacy. Obviously the huge legacy would be wonderful, but Tom needs to be acutely aware of the potential for him to have to live on food stamps for the final decade or more of retirement. Critically, by taking a passive equity index approach to saving, Tom’s fate is almost exclusively determined by luck alone. This approach is in many ways like relying on a lottery win to finance retirement. We highlight this because when we meet many investors for the first time they claim that achieving the highest possible returns is their number one priority. When prompted, they assert that low volatility comes in at a distant second or, in many cases, in not a consideration at all. Yet this logic is precisely backward; returns are in many respects out of our control as investors, but we can exert meaningful influence over the other major variable in the equation: portfolio volatility. When designing plans with our clients we often encourage them to make financial plans that are resilient to 95% of potential future realities. 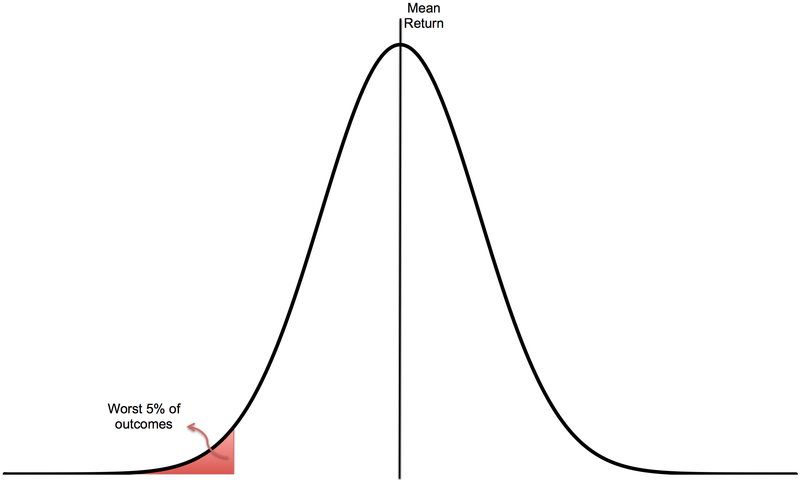 If this is our goal, then we must investigate our bell curve to discover how bad things can get in the worst 5% of periods. We will use Chart 6. to illustrate the salient concepts. The key takeaway is that higher average returns may not be, and often are not helpful in the context of planning for financial objectives over fixed horizons of 40 years or more if the returns come at the expense of substantially higher volatility. For most people the implications of missing return targets are difficult to tolerate. For savers, it means a more onerous savings burden, delayed retirement, or both. For retirees it means a lower standard of living, and potentially poverty in later years. By actively managing portfolio volatility, taking full advantage of diversification opportunities, and dynamically nudging portfolios toward top global assets twice per month, our Darwin process is engineered to minimize risks associated with the range of returns that plague traditionally managed portfolios. In tests back to 1995 the Darwin approach delivered a strong, stable return experience regardless of market conditions. As a result, even under onerous assumptions, a portfolio invested in Darwin is much more likely to hit your financial targets than a traditional approach, especially given the poor prospects for stocks at this point in the market cycle. Why do you want your financial fate to depend on the flip of a coin? 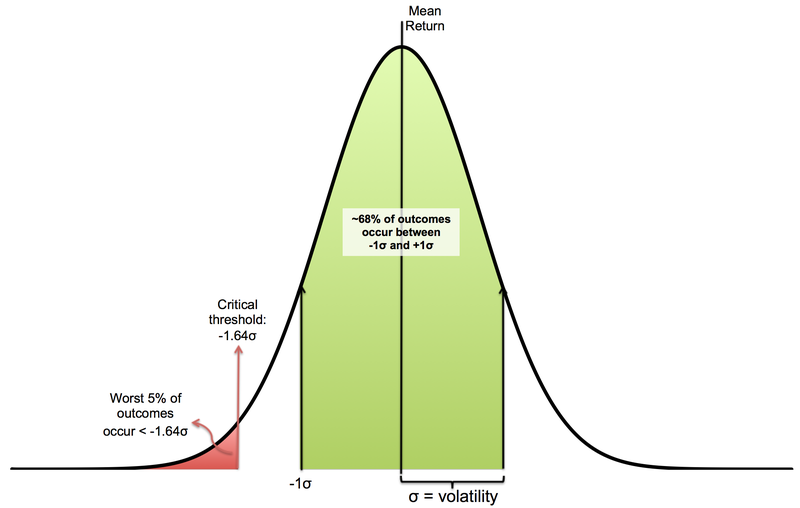 The red shaded portion of Chart 7 below, which is bounded at the right by the ‘critical threshold’, highlights the portion of the bell curve that we are most interested in: the worst 5% of outcomes. By definition, 95% of all outcomes will be better than the return at this critical threshold, so this return is what we recommend should be used for planning purposes. The green portion of the curve highlights those returns which fall within 1 standard deviation of the average (or mean). In all, 68% of all return observations will fall within 1 unit of volatility on either side of this mean return (bounded on either side by the shaded area), and 95% of all observations will fall to the right of the 95% critical threshold, at -1.64 units of volatility. In other words, the actual returns experienced by investors over a time period will exceed this threshold return 95% of the time. Remember, we are interested in calculating the portfolio return that will be exceeded 95% of the time, which means returns will be less than this level 5% of the time. As a result, this return value is called the 5th percentile return. Now that we know that the critical threshold is 1.64 units of volatility less than the mean, it is a simple matter to calculate the 5th percentile threshold return over a 1-year period, as it is simply our portfolio average return minus 1.64 times our portfolio volatility. Zα is the Z-score or number of units of volatility away from the mean, and σ is the observed long-term volatility. Note that this calculation is only valid over a 1-year period. In order to calculate 5th percentile returns over many periods, we must introduce an adjustment to account for markets’ so-called ‘random walk’. That is, markets rarely have strong negative or strong positive returns many periods in a row, so a 5th percentile outcome over 2 years is not simply equal to a 5th percentile outcome in the first year compounded by a 5th percentile outcome in the second year (geek note: that would be a 0.25 percentile outcome). To find the 5th percentile outcome over n years, you must calculate the portfolio volatility over t years. To do this, we divide the 1-year volatility by the square root of t.
Note again how, consistent with the empirical results from Chart 4. above, a balanced portfolio is likely to outperform an all equity portfolio at the critical 5th percentile threshold despite having lower long-term average returns. Given that we recommend building plans around this lower threshold, a balanced portfolio would provide for more favorable results for planning purposes than an all equity portfolio. ReSolve Asset Management Inc. (“ReSolve”). is registered as an investment fund manager in Ontario and Newfoundland and Labrador, and as a portfolio manager and exempt market dealer in Ontario, Alberta, British Columbia and Newfoundland and Labrador. In the U.S. ReSolve is registered with the United States Securities and Exchange Commission as a Non-Resident Investment Adviser. Forward-Looking Information. The contents hereof may contain “forward-looking information” within the meaning of the Securities Act (Ontario) and equivalent legislation in other provinces and territories. Because such forward-looking information involves risks and uncertainties, actual performance results may differ materially from any expectations, projections or predictions made or implicated in such forward-looking information. Prospective investors are therefore cautioned not to place undue reliance on such forward-looking statements. In addition, in considering any prior performance information contained herein, prospective investors should bear in mind that past results are not necessarily indicative of future results, and there can be no assurance that results comparable to those discussed herein will be achieved. The contents hereof speaks as of the date hereof and neither ReSolve nor any affiliate or representative thereof assumes any obligation to provide subsequent revisions or updates to any historical or forward-looking information contained herein to reflect the occurrence of events and/or changes in circumstances after the date hereof. General information regarding returns. Performance data prior to August, 2015 reflects the performance of accounts managed by Dundee Securities Ltd., which used the same investment decision makers, processes, objectives and strategies as ReSolve has used since it became registered and commenced operations in August, 2015. Records that document and support this past performance are available upon request. Performance is expressed in CAD, net of applicable management fees. Indicated returns of one year or more are annualized. Past performance is not indicative of future performance. General information regarding the use of benchmarks. The indices listed have been selected for purposes of comparing performance with widely-known, broad-based benchmarks. Performance may or may not correlate to any of these indices and should not be considered as a proxy for any of these indices. The S&P/TSX Composite Index (Net TR) (“S&P TSX TR”) is the headline index and the principal broad market measure for the Canadian equity markets. The Standard & Poor’s 500 Composite Stock Price Index (“S&P 500”) is a capitalization-weighted index of 500 stocks intended to be a representative sample of leading companies in leading industries within the U.S. economy. General information regarding hypothetical performance and simulated results. These results are based on simulated or hypothetical performance results that have certain inherent limitations. Unlike the results in an actual performance record, these results do not represent actual trading. Also, because these trades have not actually been executed, these results may have under- or over-compensated for the impact, if any, of certain market factors, such as lack of liquidity. Simulated or hypothetical trading programs in general are also subject to the fact that they are designed with the benefit of hindsight. No representation is being made that any account or fund managed by ReSolve will or is likely to achieve profits or losses similar to those being shown. The results do not include other costs of managing a portfolio (such as custodial fees, legal, auditing, administrative or other professional fees). The contents hereof has not been reviewed or audited by an independent accountant or other independent testing firm. More detailed information regarding the manner in which the charts were calculated is available on request. Any actual fund or account that ReSolve manages will invest in different economic conditions, during periods with different volatility and in different securities than those incorporated in the hypothetical performance charts shown. There is no representation that any fund or account will perform as the hypothetical or other performance charts indicate. General information regarding the simulation process. The systematic model used historical price data from Exchange Traded Funds (“ETFs”) representing the underlying asset classes in which it trades. Where ETF data was not available in earlier years, direct market data was used to create the trading signals. The hypothetical results shown are based on extensive models and calculations that are available for any potential investor to review before making a decision to invest.